With contributions by Stefan Gerlach, Stefano Grosso, Lars Leeten, Ekaterina Poljakova, Thomas Pölzler and Christian Ströbele. The article deals with Niklas Luhmann’s contribution to the philosophical discussion on power. Using Hannah Arendt and Byung-Chul Han as an example, it shows to what extent Luhmann’s new formulation of the problem can replace the old debate. First and foremost, the question of the essence of power, as well as the question of distinguishing between power and violence, appears obsolete. Criticising the assumptions of the classical power theory, Luhmann nonetheless is not trying to replace them, but to present them more as the components of today’s power code. The article adheres to this methodological guideline so as to reveal the paradoxical modal and temporal structure of power. The next step, however, is the critical questioning of how Luhmann, while reducing power to reduction achievement, might himself have adopted an assumption of power communication, i.e. the idea of power as a scanty asset which can only be fought for. The question is whether the theory of power can distance itself from such a notion. Practical aspects have big importance in Schelling’s whole philosophy. They are effective in the constitution of mind and in the ontological and historical significance of real actions. Therefore it has to be researched what Schelling means by the practical inner function of mind as ›act and action‹ (Tat und Handlung) and how real actions of God and human beings follow from this. The result of the enquiry is that the theory of potentials of the late Schelling includes the ontological reason for being and constitutes by the same way the will and the reason for individual divine and human actions. Thomas Pölzler: Wie schlüssig ist Albert Camus’ frühe »Logik des Absurden«? In his novel The Stranger, his play Caligula and in particular his essay The Myth of Sisyphus Albert Camus developed a first version of what he called a »logic of the absurd«. According to this idea, human existence is characterized by a tension between our longing for meaning and a world which continuously disappoints this longing. The right way to respond to this recognition is claimed not to be suicide or giving up one’s longing for meaning. Rather, Camus recommends an attitude of permanent revolt. In my article I explore the soundness of this early »logic of the absurd«. It will turn out that as long as one reads Camus’ claims in the way he mainly seems to have intended them – as applying to all persons and as being objectively valid – they are implausible. In order to exploit their full potential one must rather reinterpret them psychologically. Camus shows how we can live a life of happiness and dignity despite our being unable to reach meaning. This literature review describes the current state of research on the Greek sophists. It draws on recent work on the beginnings of rhetoric, overviews of sophistic thought and case studies on Protagoras, Gorgias, Antiphon and Prodicus. 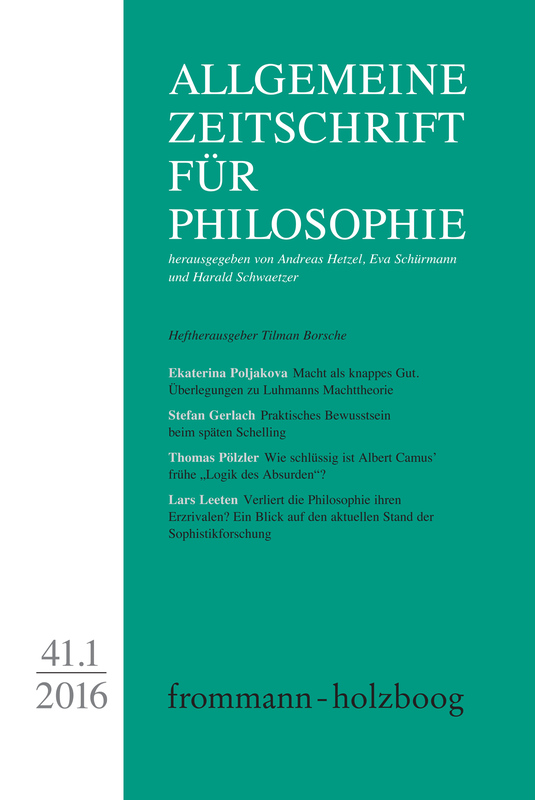 It is shown that the traditional notion of a sophistic antithesis to philosophy has lost further ground: While earlier »rehabilitations« of sophistic thought still use the dichotomous distinction of philosophy und sophistic, now any generic talk of »the sophist« should better be regarded as misleading. Stefano Grosso: Der Herr, der Knecht und die symbolische Macht (zu Hannes Kuch, Herr und Knecht. Anerkennung und symbolische Macht im Anschluss an Hegel).